Background: Using autologous tissue is a simple process and ideal choice for augmentation of the soft facial tissue. In this regard, platelet-rich fibrin matrix (PRFM) is used for the correction of fine rhytids and nasolabial folds (NLFs) as well as facial augmentation. This study tries to evaluate the tangibility of PRFM for facial augmentation. Materials and Methods: In this study, 20 patients (20–45 years) were studied to examine the augmentation (4 patients were excluded). For each, 3cc of PRFM provided by using 35cc of autologous blood and injected through subdermal technique into NLFs. Thickness and volume of the tissue were measured before and 3 months after treatment by sonography. The collected data were analyzed through paired t-test and independent t- test by using SPSS version 19.0 (SPSS Inc., Chicago, IL, USA). Results: The study included 16 women, with average of 39.43 ± 6.84 years (age range, 20–45 years). The thickness and the volume of subcutaneous tissue in NLFs before and after treatment show no significant difference on the right side rather than on the left side (P > 0.05), but the thickness and the volume of the tissue on both sides after treatment shows significant increase rather than before treatment, so that this increase was significant statistically. This study shows that different right and left thickness was 0.54 ± 0.51 and 0.51 ± 0.38 (P ≤ 0.001). Further, different right and left volume was 0.25 ± 0.20 and 0.26 ± 0.22, respectively (P < 0.001). Conclusion: According to the results, the increased tissue volume by PRFM still persists after 3 months of treatment and its retention has been effective on the healing process. Economic, social, and public health burdens caused by chronic wounds and tissue deficits are very heavy that increase with age. Various methods and materials have been used to increase the volume; among them, a variety of gels can be mentioned. The ideal autologous tissue and augmentation direction are important while the best choices are fat and fat associated with platelet. However, the use of gels can be followed with certain risks, including adverse skin reactions, and subcutaneous tissue infections. Other methods include injecting fat or fat associated with platelet. Since fat and platelet are body's own tissues, the latter methods cause fewer complications in the patients; however, they last less as well. Nonetheless, issues such as a need to remove the tissue, invasive, postoperative recovery, and unpredictable longevity, and survival of grafts makes the surgeons willing to use less invasive methods and materials. These materials may be absorbed, infected, or associated with chronic granulomatous response. Many attempts have been done to use patient's collagen for soft-tissue augmentation; however, they showed limited permanence. Volume deficiency in areas of deeper folds, such as the nasolabial folds (NLFs), typically is treated with injectable dermal fillers. Disadvantages include the transient effects of temporary, resorbable fillers, and foreign body reactions such as encapsulation, granuloma formation, and chronic or delayed infections, in the case of injectable, permanent fillers. The injection of cultured fibroblasts is costly, time-consuming, and associated with ambiguous results. In this regard, the platelet-rich plasma (PRP) has been studied in the past four decades. PRP preparations have been shown to enhance early healing in both animal and human models, in a transient way. It has also been used in many surgeries to enhance the healing of soft tissues, including chronic wounds in the lower parts of the body. Platelet gel and thrombin-based fibrin glue mixed with calcium chloride are applied to the outer surface of the tissue to accelerate wound healing, bone growth, homeostasis, and wound closure., Therefore, this property can be used to increase the survival of tissue filler. It has been proven that fibrin matrix increases transfer of platelet growth factors (GFs) to the wound. Platelet-rich fibrin matrix (PRFM) is distinct from PRP and can be produced with as little as 9 mL of peripheral blood. PRFM does not produce the very high platelet concentrations that are seen in PRP. Unlike PRP, PRFM does not rely on so high level of concentrations of platelets and a vast, once release of GFs but rather on leading to a more natural, persistent wound reaction. The collection of 9cc blood sample allows the collection of 4cc of PRFM. The development of collagen and dermal matrix increases over 3 weeks and there is early evidence to suggest long-lasting wrinkle correction (up to 20 months). This causes the concentration of platelet, but the concentration level is not as high as what is seen in PRP. In return, platelets are provided with an actively polymerizing three-dimensional fibrin substance. This substance helps to localize tissue activity because both platelets and GFs, as a process that naturally occurs in the wound, to which they are bonded. In addition, it has been found that platelets provided in PRFM continues to synthesize in the body and releases bioactive GFs during the first 7 days. The skin area is treated through intratreatment using G30 needle or subdermal treatment by means of a G27 needle. Mild edema and ecchymosis may happen, but they go away after a few days, and the significant recovery can usually be seen after 1 or 2 weeks after the treatment. As noted, many studies examine use of PRFM, but there are few rich and sufficient studies on persistence of PRFM as tissue filler. Therefore, in the present study, it is tried to analyze the permanency rate of injected PRFM into the NLFs. 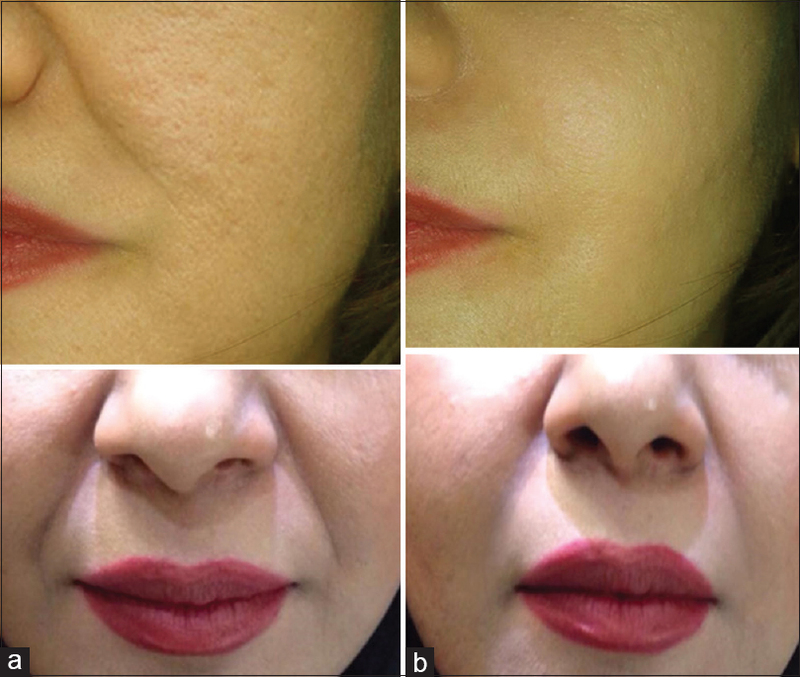 This before-after study conducted on all patients referred to the plastic surgery clinic of Al-Zahra Hospital correcting the NLFs that were not candidate for lift procedure in 2013. Informed consent was obtained from all patients before the study began. Of the whole population, 20 female patients in the age range of 20–40 years without any disorders in the skin, connective tissue, and history of immunosuppressive and radiotherapy were randomly selected in compliance with ethical obligations and entered into the study. Before injection, the thickness and volume of subcutaneous tissue in NLFs were measured by the sonography (Mind Ray DC8, Probe linear frequency 7–12 mHZ). At first to prepare PRFM, 40cc of blood was taken from each patient's antecubital vein in sterile conditions and slowly entered into special tubes. After gently shaking up the tube, it was centrifuged for 12 min with 3200 rpm, and the blood was separated into two parts [Stage I of [Figure 1]. The top layer containing plasma and platelet suspensions was imported into a glass and centrifuged for 7 min with 1100 rpm. The resulting solution was drawn up by an aprotinin contained syringe and shaken up gently. Finally, the PRFM, as a light-yellow transparent layer, was formed [Stage II of [Figure 1]. Then, 3cc of obtained PRFM was injected through subdermal technique into the NLFs of the patient. Three months later, the added thickness and volume of patients (4 patients were excluded because of being under the treatment by corticosteroid NSAID immunosuppressive) were measured through sonography and the changes were evaluated by photography as well [Figure 2]. Then, using the SPSS software version 19.0 (SPSS Inc., Chicago, IL, USA), collected data were analyzed through paired t-test and independent t-test (P < 0.5). The study included 16 women, with an average of 39.43 ± 6.84 years (age range, 20–45 years). After 3 months from treatment, the evidence shows no improvement in the condition of 2 patients (12.5%) and in other words, it shows improvement in 87.5% of patients. The thickness and the volume of subcutaneous tissue in NLFs before and after treatment show no significant difference on the right side rather than on the left side (P > 0.05), but the thickness and the volume of the tissue on both sides after treatment shows significant increase compared to before treatment, so that this increase was significant statistically (different right thickness: 0.54 ± 0.51 and different left thickness: 0.51 ± 0.38, P ≤ 0.001; different right volume: 0.25 ± 0.20 and different left volume: 0.26 ± 0.22, P < 0.001) [Table 1] and [Figure 3]. Using autologous tissue is a simple process and ideal choice for augmentation of the soft facial tissue. The early efforts to use the autologous collagen to improve the process of augmentation of soft tissue suggests that that persists for a limited time. In the best conditions, the body's natural capacity for producing collagen will be used to create additional mass. Sclafani et al. in a study examining the effects of PRP have noted the initial increase in endothelial cells and fibroblasts in wound that lasts more than 7 days. However, the initial effect on fibroblasts and endothelial cells encouraged researchers in the natural control mechanism for wound healing and collagen production to increase the soft tissue. In this regard, for several years, PRFM has been used clinically in orthopedic surgery, wound healing applications. The results of this study on the 16 women in the age bracket of 20–45 years showed that the thickness and volume of the subcutaneous tissue in the area of NLFs after the injection of PRFM have had a dramatic and significant increase that this process of improving the treatment in the area of NLFs is not different on the left or right side. The study on the conventional method using PRFM on ulcers of chronic venous of leg lead to 66.7% wound healing after 16 weeks. It was clinically mentioned a significant decrease in scores on Wrinkle Assessment Scale in facial plastic surgery, after injection of PRFM intradermal or subdermal and in moderate to deep NLFs. This improvement was observed in the first 2 weeks after treatment and 12 weeks (duration of the study) persisted. The treatment of NLFs with dermal or subdermal PRFM injection has showed significant improvement within 2 weeks of treatment. This treatment has not shown any decline for 3 months. Lucarelli et al. in their study found that PRP has poor mechanical properties (flexibility and stability of the resulting material is less) and its producing is difficult and requires special equipment. Meanwhile, GFs derived from it may be easily lost during surgery while PRFM not only has strong mechanical properties but also produce by high-speed centrifuge of platelets and fibrin, in the absence of thrombin, and it is as a tool that has the potential to speed up repairing tissues and maintains its mechanical properties during testing and has more stability. It should be noted that in two cases (of patients) that did not progress after injection, unknown factors (e.g., related to their skin and specific platelet activity) have prevented an appropriate response. One of the limitations of this study which can be mentioned is the lack of possibility to follow the study for more than 3 months which can be suggested as further studies to evaluate the PRFM durability over this period because other studies have also examined the maximum of 12 months and, therefore, this persistence in consecutive months up to 12 months of follow-up and can also be done in a comparative way. Generally, with the determination of the status of platelet and GFs and improving the response of physiological tissue in the area under treatment, PRFM causes reproducing of guided tissue. Therefore, in the present study, effective clinical results in increasing the thickness and volume of subcutaneous tissues in NLFs have been observed and have been provided by using PRFM that presents a natural treatment by reproducing autologous tissue. Sclafani AP, McCormick SA. Induction of dermal collagenesis, angiogenesis, and adipogenesis in human skin by injection of platelet-rich fibrin matrix. Arch Facial Plast Surg 2012;14:132-6. Sclafani AP, Romo T 3rd, Parker A, McCormick SA, Cocker R, Jacono A. Autologous collagen dispersion (Autologen) as a dermal filler: Clinical observations and histologic findings. Arch Facial Plast Surg 2000;2:48-52. Watson D, Keller GS, Lacombe V, Fodor PB, Rawnsley J, Lask GP. Autologous fibroblasts for treatment of facial rhytids and dermal depressions. A pilot study. Arch Facial Plast Surg 1999;1:165-70. Roy S, Driggs J, Elgharably H, Biswas S, Findley M, Khanna S, et al. Platelet-rich fibrin matrix improves wound angiogenesis via inducing endothelial cell proliferation. Wound Repair Regen 2011;19:753-66. Anitua E, Sanchez M, Nurden AT, Zalduendo M, de la Fuente M, Orive G, et al. Autologous fibrin matrices: A potential source of biological mediators that modulate tendon cell activities. J Biomed Mater Res A 2006;77:285-93. Sclafani AP. Safety, efficacy, and utility of platelet-rich fibrin matrix in facial plastic surgery. Arch Facial Plast Surg 2011;13:247-51. Carroll RJ, Arnoczky SP, Graham S, O'Connell SM. Characterization of Autologous Growth Factors in Cascade Platelet-rich Fibrin Matrix (PRFM). Edison, NJ: Musculoskeletal Transplant Foundation; 2005. Sclafani AP. Platelet rich fibrin matrix for improvement of deep nasolabial folds. Presented at: The Annual Meeting of the Triological Society. J Cosmet Dermatol 2009;9:66-71. Sclafani AP, Romo T 3rd, Ukrainsky G, McCormick SA, Litner J, Kevy SV, et al. Modulation of wound response and soft tissue ingrowth in synthetic and allogeneic implants with platelet concentrate. Arch Facial Plast Surg 2005;7:163-9. Azzena B, Mazzoleni F, Abatangelo G, Zavan B, Vindigni V. Autologous platelet-rich plasma as an adipocyte in vivo delivery system: Case report. Aesthetic Plast Surg 2008;32:155-8. Cervelli V, Gentile P. Use of platelet gel in Romberg syndrome. Plast Reconstr Surg 2009;123:22e-3e. Lucarelli E, Beretta R, Dozza B, Tazzari PL, O'Connel SM, Ricci F, et al. A recently developed bifacial platelet-rich fibrin matrix. Eur Cell Mater 2010;20:13-23. Asadi M, Alamdari DH, Rahimi HR, Aliakbarian M, Jangjoo A, Abdollahi A, et al. Treatment of life-threatening wounds with a combination of allogenic platelet-rich plasma, fibrin glue and collagen matrix, and a literature review. Exp Ther Med 2014;8:423-9.